Saturday, April 25th, 2015, at 7:30 p.m., the Carter Family Fold in Hiltons, Virginia, will present a concert of bluegrass music by J.P. Mathes and the Kentucky School of Bluegrass Ensemble. Admission to the concert is $10 for adults, $1 for children 6 to 11, under age 6 free. 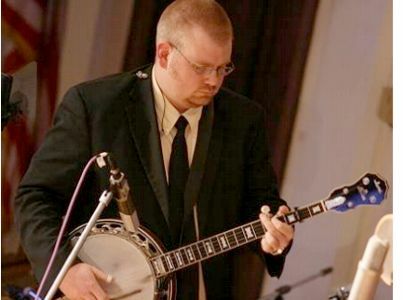 JP Mathes has been performing at the Carter Fold since he was 16 years old - first as a member of the ETSU Bluegrass Band and later as the Ensembles Director of Hazard Community College’s Kentucky School of Bluegrass & Traditional Music (KSBTM). The student performers include Caleb Edwards (mandolin) from Indiana; Bobby Earl Whitaker III (guitar) from Jackson, Kentucky; and James Colwell (bass) from Hazard Kentucky. Special guest performers will include Dean Osborne, two-time Grammy award winner, Curtis “Dr. Dobro” Burch, and on fiddle Leona Tokutake Mathes from Tokyo, Japan.